If you enjoy hiking, avoiding crowds and taking images while exploring off the beaten path, then this is the hike for you. This leisurely off-trail hike is oriented toward photographers of all levels who don’t mind getting out in the cold weather. AOA Photography Chairman, Kathy Cubert will lead the hike along with other AOA volunteers. Mercer Woods is in the scenic Hocking River valley in the northern extent of the Hocking Hills. It is a part of AOA’s Hocking River Conservation Corridor initiative. The 112-acre parcel includes typical Hocking Hills landscape features including sandstone outcrops, a small gorge and headwater streams and waterfalls in the several ravines. Mercer Woods is home to a relatively mature hardwood-hemlock forest. 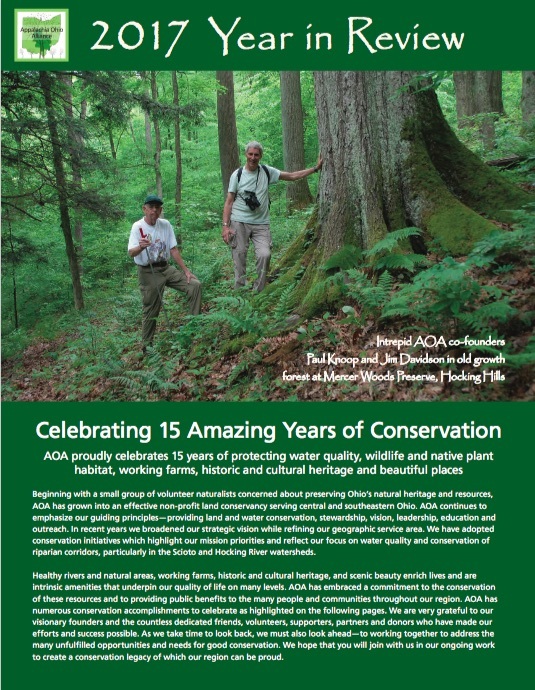 It contains the largest trees and the most impressive old growth forest found on any of AOA’s many preserves. The highlight is a nearly 5-foot diameter oak. Following the hike, post your best image taken during photography-oriented hikes with AOA this winter by entering our Instagram photo contest which is starting on February 9 and ending March 30, 2019. The theme for our winter contest is Over the River and through the Woods. Post your favorite images on Instagram by adding #throughthewoodswithAOA and @mpex_photo_video to the shot. Both must be added for the image to count towards the contest. One photographer will win a free class credit at Midwest valued at $50.00. A big thank you goes to Midwest Photo for donating the contest prize! The Mercer Woods hike and other AOA events are free and open to the public. This activity will be held snow, rain or shine – so please come prepared and dress appropriately for the weather and hiking on slopes. Wear multiple layers and boots that keep your feet dry and warm. Time: Meet at 8:00 a.m. The hike will last approximately two hours. Afterwards, feel free to wander the preserve on your own. What to Bring: Snacks and/or drinks of your choice. Mercer Woods is located at 9016 Buckeye Troxel Road, just southeast of Sugar Grove.